Family Mahjong II: Shanghai he no Michi (ファミリーマージャンII 上海への道, Family Mahjong II: Shanghai he no Michi? lit. 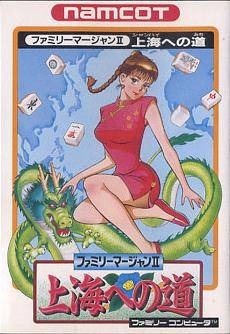 Family Mahjong II: Shanghai Style) is a mahjong simulation developed by Nihon Bussan for the Famicom and published in Japan by Namco near the end of 1988. In addition to the standard Mahjong mode, there is a tournament mode with a slight RPG aspect to it, in that the player can enhance certain stats after winning games in order to increase their odds in future rounds of the tournament. The game is based on a one-on-one version of Mahjong, less common in real-life Mahjong games but the standard for computer adaptations due to the reduced complexity of having only a single AI opponent. Nihon Bussan was responsible for Family Mahjong II's development and was at the time fairly well known for their Mahjong Arcade games. This page was last edited on 14 March 2015, at 00:30.